snickers bar stuffed chocolate chip cookies. 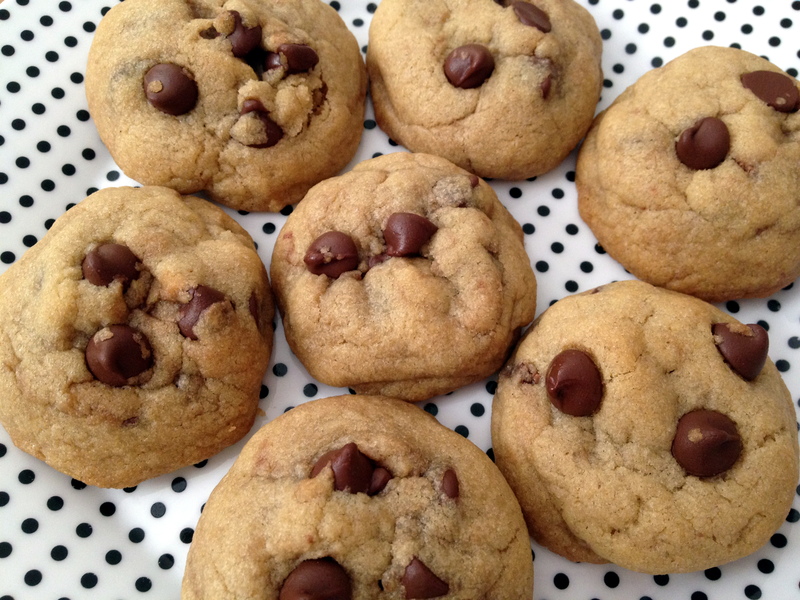 i have 3 incredible variations of chocolate chip cookies to share this week! i’m excited to start them off with these babies. these aren’t just any old chocolate chip cookies. they are stuffed with snickers bars! 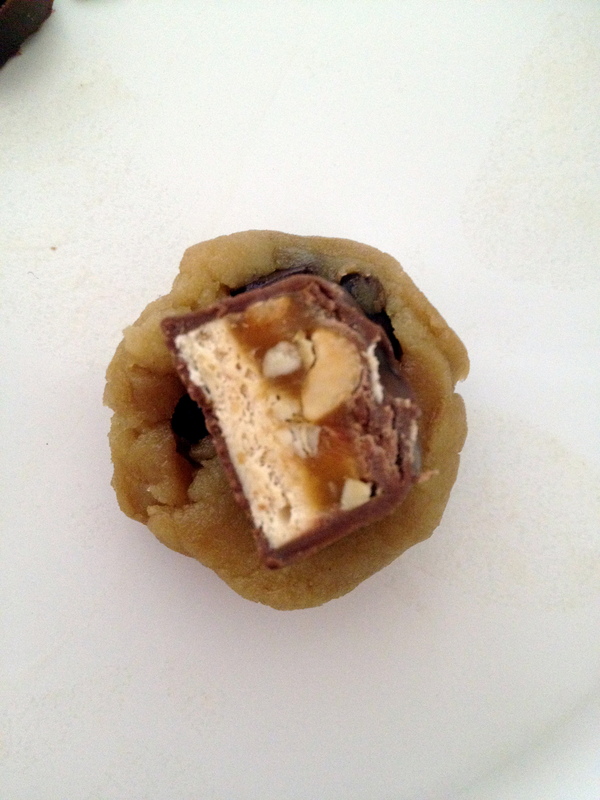 i got the idea from Averie over at love veggies and yoga to stuff chopped snickers bar pieces inside of a chocolate chip cookie. brilliant! 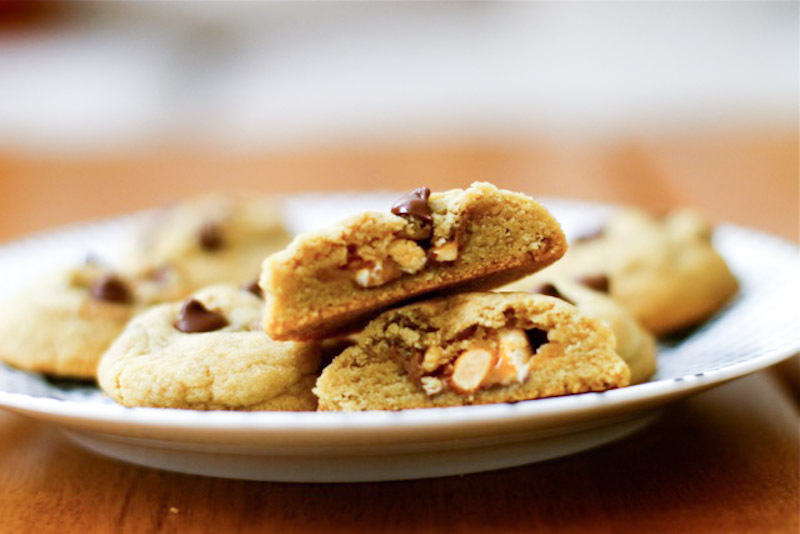 Averie has an incredible repertoire of delicious cookie recipes. what is better than candy inside a cookie?! Preheat oven to 350 degrees. Beat the butter and both sugars together on medium speed until light and creamy. Add the eggs one at a time, mixing well after each. Add the vanilla. Mix in the flour, baking soda, and salt until just combined. Add the chocolate chips and mix until incorporated into the dough. 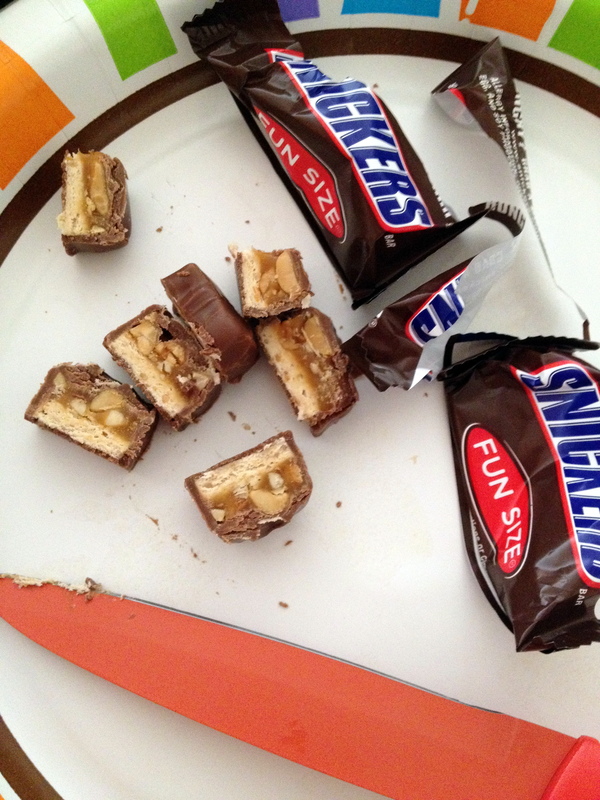 Take a tablespoonful of dough and press a snickers piece in the middle. (pictured above) Cover with a “lid” of dough, making sure to press down so that the snickers piece is sealed inside. 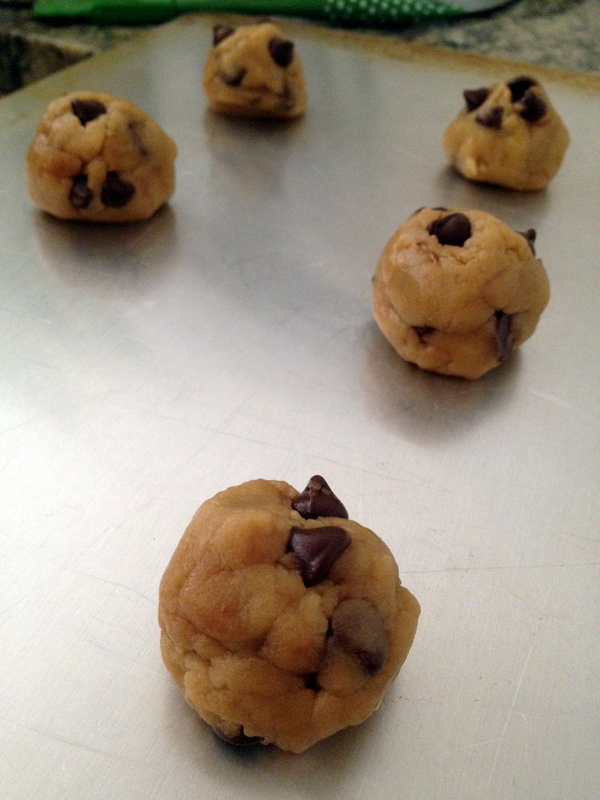 Place onto baking sheet and bake for 10 minutes, or until edges are slightly browned. Remove and let cool completely on a cooling rack. Enjoy! « mini chocolate chip cookie sandwiches. My husband would re marry me if I made these. Those are his two favorite sweets into one. 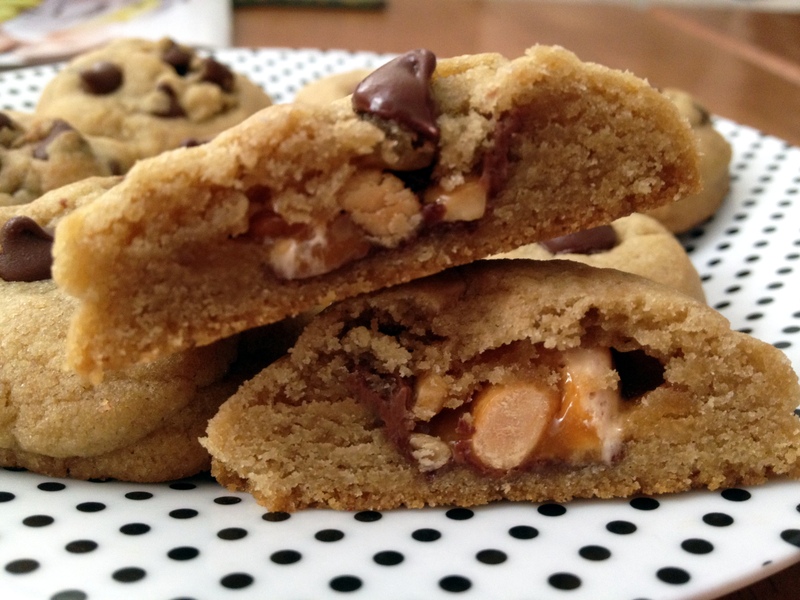 snickers and choc chip cookies are a match made in heaven, that’s for sure! Thanks for blogging about these! Oh my gosh now these are my kinda cookie!! They look SO yummy! I’ve never run into stuffed cookies, really, they look so good! Sally, I can’t get over how delicious these look, and I also can’t get over the self control you must have had not to eat the Snickers bars whole! That is one thing I couldn’t do, I’m afraid. Great recipe though! thanks Georgia! god knows where my self control came in. i had the snickers bars for about a week before making the cookies! You are going to kill me this week! It is the start of my, get back on track with eating better week! Well longer than a week, but I just started, and all these temptations! Oh WOW! These are so dangerous! I love stuffed cookies. They are very deceiving but once you take that bite into the cookie, it is absolute heaven. Wow!!! I love stuffed cookies.. I´m gonna give this a try! it s so yummy! *Sigh* Now I want to make cookies! These look amazing!